Winter Signs. Earlier in 2017 I read Autumns Dance the first book in the Season’s Named series. That book was fantastic and I wrote about it here. So I eagerly awaited Winter Signs when Sarah first told me about her idea for it (a deaf heroine with a heartbreaking past). No, I won’t give spoilers. I will tell you it’ll make you cry, (so have good tissues on hand). If you loved Autumn’s Dance, you’ll love this one too. Loving Brody & Saved by Sam Ok, so it is hard to review/ summarise this book without giving plot spoilers… so I’ll say this. She’s done it again, and if you like books that give you a happy ending (but make you really work for it and cry in the process) then you’ll like this. If you read Loving Brody and think “What was Lisa on about?” read Saved by Sam (the second book) and you’ll know what I mean (I warned you. Have the tissues on hand). 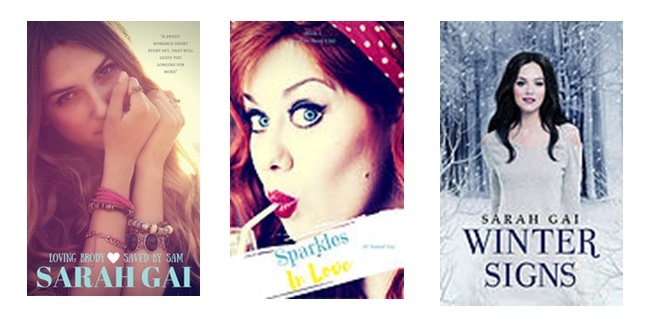 These stories have a similar emotional feel to the Season’s named series, although they are very different stories, and Loving Brody & Saved by Sam are a shorter read than the Season’s Named series (Autumn’s Dance and Winter Signs). Sparkles in Love well, while Winter Signs made me cry, Sparkles made me smile. I really love the whole story and I think I’ve talked her into writing a second book (fingers crossed!). If you like Sarah’s Curvy Series then you’ll like this one. It’s plus size, sweet romance with a chic lit vibe. Sarah’s Christian and so most of her books have Christian themes but if you’re not into that at all, she doesn’t beat you over the head with it either and you’ll still enjoy these stories. Sarah’s working on a fantasy series she’ll bring out later in 2018 and I’m looking forward to reading that when it comes out too. Check out her books here.